It is a very rare occasion in which I make a meal out of fries. It is even more rare that this happens at a Greek restaurant. Yet, when Pitta Souvli in Chandler offered up a special called Chipotle Gorgonzola Cheese Gyro Fries, I couldn’t resist. There was just one problem: nowhere in the description of the fries were tomatoes mentioned. And yet, as you can tell by the picture to the left, there were obviously tomatoes involved. I grew up spoiled when it came to Greek food. I mean, Detroit even has a Greektown and I’m not sure you can say the same for any other city anywhere. 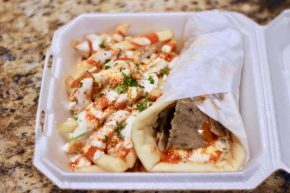 Recently, though, I found myself picking up some Greek food from Saba’s Mediterranean Kitchen in Phoenix and and was intrigued not just by the classic stuff, but by the unique twists I found there. 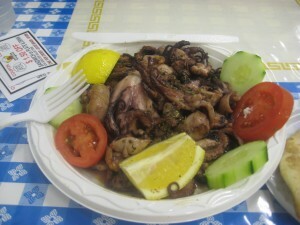 Growing up in the Detroit area, it was pretty easy to take Greek food for granted. There is literally a Greektown in Detroit and Greek food can be found in every suburb. LA, however, is not so fortunate in this Mediterranean fare. Thus, I was pretty excited when I was invited out to the Good Greek Grill‘s new location in Hollywood for a free sampling of their food. In a land where they pronounce gyros like the beginning of gyroscope, a friend of mine never shuts up about the greatness of the gyros at a place called The Greek Gourmet in Squirrel Hill. The Greek Gourmet, by the way, is more of a quickie Greek market than a restaurant, seeing as it only seems to serve gyros alongside its packaged hummus, tzatziki, pita and whatever else you may expect from a Greek grocer. Downtown Pittsburgh might have some shiny new restaurants, there are still some spots that remind me of my native Detroit. One of these is Mike & Tony’s Gyros, a Greek place that has American favorites like burgers as well. As we stumbled our way to a Pirates game, this seemed like the best place to stop and grab some much-needed food. We were met by a griddle, spools of meat and smiling faces that told us of an $8 special including a gyro (painfully pronounced like gyroscope), fries and a drink. Sometimes the best way to find out about a new restaurant it to simply see it and decide you want to try it out. No research, no recommendation. That’s how I ended up at Firehouse Restaurant in Tarzana, a Greek place whose sign stating “GYRO” dwarfs the sign with the actual name of the restaurant. 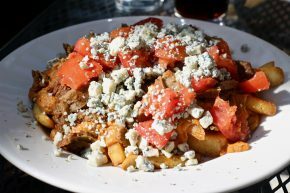 Being from Michigan, I have a pretty strong opinion about Greek food and I was more than a little worried that I was going to leave disappointed. In North Hollywood there is a deli unlike any I had ever seen before. Rather than being filled with cold cuts, pastrami or Italian sandwiches, this deli has food with more of a Greek and Armenian flair. It is called Noosh Deli and although not the usual deli, I figured it had to be worth a try. Scanning the menu, I decided any Greek place had to have some good gyros, so I ordered their Beef Gyro Sandwich (with fries and a drink for 6.99). It came with lettuce, tomato, onion and yogurt sauce. I ordered without the veggies and waited 7 or 8 minutes until the sandwich was prepped and ready to go. My usual drive to Las Vegas involves getting there as fast as possible to gamble and returning as fast as possible to cry into my pillowcase after losing copious amounts of money. This trip, however, was a bit different. Rather than a rush back home, we took our time and stopped for lunch. 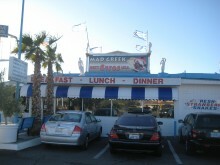 Anyone who has made the drive between Los Angeles and Las Vegas knows of the Mad Greek Cafe. Billboards seem to advertise the “Best Gyro” every few miles, so for our little road trip lunch, we thought a trip to Baker, California and a stop at the Mad Greek Cafe would be worth our while. I had wanted to go to Papa Cristo’s for a long time, but I just didn’t realize it. You see, the outside of the restaurant/market really makes no major reference to the name of the place. Instead, it just says “Greek Food.” When my friend suggested trying it, I complied without realizing it was the place I had driven by so many times. Inside, the place has a miniature Greek market, a counter to order food at and a big room that can double as a dining room or banquet room. My first stop was the counter to place my order. We ordered some of the Octapodakia appetizer, which is grilled baby octopus. I also ordered the Kreatopita, deliciously described on the menu as a meat pie. For my main course, I decided to get back to the Greek basics and ordered the Gyros sandwich. This came with lettuce and tomatoes, so I ordered it without. Edit: This location is gone, but Daphne’s as a whole is not. 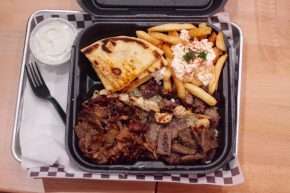 Since the entire concept of Greek fast food is a bit confusing, I decided to check out Daphne’s Greek Cafe in Culver City and see what it was all about. A quick perusal of the menu revealed the Pitaburger. 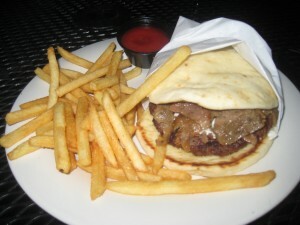 This burger is pretty much exactly what it sounds like, because instead of a bun, they use authentic Greek pita. The differences between this burger and other burgers does not end there, however. Rather than typical burger toppings, this one comes with Greek offerings like feta cheese and for an additional bit of pocket change, you can get gyros added to the burger to make it as meaty as possible. This burger was not without fault in its intended version, though, as it also came with burger killers like lettuce and tomato.